If you’re in the market for a top notch stroller, the Graco Metrolite Travel System Cherry Blossom comes highly recommended. It has so many great features, and contains everything you need in a stroller. The Graco Metrolite is comfortable for parent and baby alike. It’s as sturdy as a regular sized stroller, yet it is lightweight and flexible. It has a detachable snug car seat that fits inside the stroller, making a comfortable ride for your baby. One nice feature is the indicator that tells you when the car seat is properly secured. The car base remains in your car, allowing you to bring your baby in from the car to the stroller without disturbing your sleeping child or taking your baby out of the seat. Parent-comfort features include a lightweight aluminum frame with a five and three point harness, with two cup holders, and organizing tray. Its deluxe canopy has windows both on the top and at the rear. It has an easy one-hand fold-up mechanism and three position reclining feature. However, there were a few things that we didn’t like about this stroller. The straight handle is not as comfortable as a curved one would be. And it’s hard for the baby to sit up straight. It’s difficult for my child to reach her treats or her toys. And if she does finally reach them, the entire back comes up with her! It’s remarkably easy to open and close, however. This feature alone makes this stroller fabulous. If I were to rate this, I would give it an 8 out of 10. 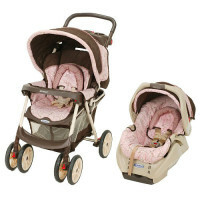 I heartily recommend the Graco Metrolite Travel System Cherry Blossom for any parent.